I picked this up at the Transit Museum in Grand Central. I've yet to head out to Brooklyn to the real Transit Museum (I promise, this summer! ), but I do like visiting the annex in GCT. It's fun, and they have really in-depth exhibits, plus a great Christmas train set, and a great store! A store that takes up like half the exhibit space, which is probably why I love it so much. 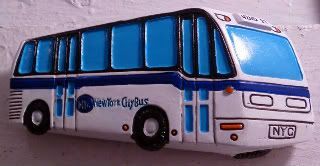 Anyway, when I saw this magnet I had to get it, because I love riding the bus. Love it. People always mock me because I'm like the little blue-haired ladies who ride the bus, rather than take the subway. It's true - if given the choice between taking the bus and taking the subway, I'd rather take the bus. Even if the bus takes forever and a day, if I have that time to lose, I'll take it. First, I love that the buses provide the best way to connect me to places that the subways can't easily do - that's uptown trying to cross through the parks. Plus, transferring bus to train and vice versa is way better than forking out another $2.25 to get the rest of the way somewhere - or worse, having to walk the long avenue blocks. Second, I love that it stays aboveground, and I can see the world driving by. It's the same reason that I love the train. I'm travelling, comfortably, lost in my own thoughts, and not having to pay attention how I'm getting somewhere. Third, people are so interesting on the bus. Random conversations, random fights, random people. Mind you, I once saw a guy board with a foil-wrapped cardboard box backpack, complete with a foil-wrapped cardboard satellite dish and video camera. Still to this day, the oddest person I've ever seen on a bus. Anyway, I owe a lot to the bus system of this town. It sustained me for over a year while I refused to go down into the subway after falling into the subway tracks at Times Square. So, yay, buses! I'm the complete opposite. If given a choice between the subway and a bus, I will almost always choose the subway. I like that there's absolutely no way to get lost on the train. Missed your stop? Just go back one. With buses it's like venturing into unknown territory. after falling into the subway tracks at Times Square. Thanks, cc. I like it, too. So funny - I can totally get lost underground - especially going to the outerboroughs. At least when I'm aboveground, I can see the street names! And, yep. Totally fell into the Q/W line at TSQ. Was not fun. Well, except the ambulance ride. That was kinda fun. But they refused to turn on the sirens for me, on account of it not being a heart condition or life/death situation. But whatever.